AXUM, Ethiopia – Thirty pregnant women at the Almeda Textile Factory Clinic gathered around a small solar-powered projector, raptly watching an animation on pregnancy health. Gebreamlak Giday walked them through the video lesson, explaining the importance of receiving antenatal care, how to recognize danger signs and why they should prepare for possible complications. “It is a dream come true,” he later said of the solar-powered teaching device. Mr. Gebreamlak is an instructor at the midwifery department of Axum University, in northern Ethiopia, and he is part of a group of health professionals piloting the new mobile learning system. He has been coordinating the use of the device for the past eight months, and could hardly hide his fascination with the technology. 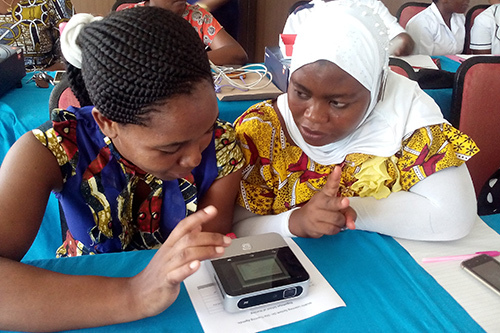 The portable learning device, with its solar-charged battery, built-in Android tablet and pre-loaded multimedia training lessons, is designed to overcome challenges frequently encountered in rural areas with poor infrastructure, such as erratic electricity supply and poor internet connectivity. Intended for teaching health professionals, the lessons cover life-saving skills such as post-partum haemorrhage, pre-eclampsia, obstructed labour, post-abortion care, family planning and essential newborn care. The training materials were developed by UNFPA, the World Health Organization and Jhpiego, and meet international clinical guidelines. Lessons on a variety of related health topics, such as nutrition, are also available for health workers and communtiy members. UNFPA began pilot-testing the device in Ethiopia and Tanzania in March of this year. It quickly proved a success. Since then, over 2,700 midwives and health workers and individuals have received training. 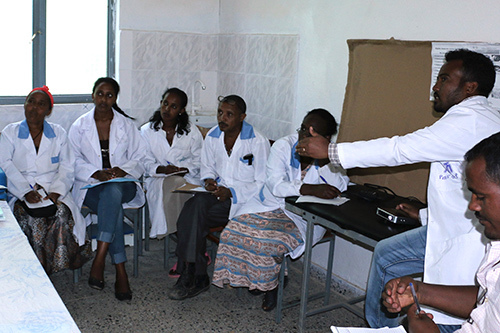 In Ethiopia, the technology has been piloted in seven health and training institutions – including three sites that Mr. Gebreamlak is overseeing – in the Tigray and Oromia Regions of Ethiopia. 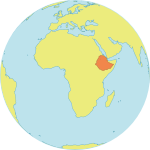 It has also been used by the Ethiopian Midwives Association. Mr. Gebreamlak says it has improved the quality of education for midwifery students at Axum University, as it allows for a variety of teaching methodologies. It is also being used for mentoring health professionals at remote health institutions. Selamawit Giday, a health-care worker at the Adwa Health Center, says the trainings have helped improve her ability to manage childbirth complications. She added that the skills are also helping her colleagues provide compassionate and respectful maternal health care. While the learning system is designed to teach small groups of health professionals, Mr. Gebreamlak says it has also been useful in reaching broader groups. For example, influential members of the community, like religious leaders and elders, are occasionally gathered to learn about the benefits of antenatal care, giving birth under the care of a skilled health professional and receiving post-natal follow-up care. These efforts are helping to raise awareness of these issues in the wider community. He and Mr. Gebreamlak both called for scaling-up the use of the learning system. Its value will be lost if more health workers are not trained to use it, and if more people are not reached with its lessons, they emphasized. “I don’t want this promising initiative to die down,” Mr. Gebreamlak said.